The Multichannel Forensics projects you're asking me to work on have taken a turn. Two years ago, you asked me to explain how customers interacted with channels. One year ago, you asked me to explain how customers interacted with both channels and merchandise divisions, with an eye toward forecasting the future. Then you saw what the future held, and it wasn't pretty. Today, you ask me to use Multichannel Forensics to identify customers who will keep purchasing if advertising is significantly reduced. The framework isn't significantly different than Multichannel Forensics projects from a few year ago. I still measure how customers interact with products, brands, and channels. And I still forecast the long-term trajectory of your business by product, brand or channel. The mechanics of the project, however, have changed. We use whatever data is available to understand how customers move along the continuum above --- organic, social, algorithm, advertising, and begging. We attempt to identify where the customer resides on this continuum. Customers who respond to begging (discounts, promotions, free-shipping, GWPs) are at the bottom of the ladder. We'll need to market to them, and we'll need to give them a reason to purchase. These may be profitable customers, but we'll have to work hard at creating gimmicks to encourage them to purchase. This is the realm of the marketer, especially in Fall 2008. In so many ways, we ruined e-commerce with our obsession of begging customers to purchase. Traditional direct marketing focused on customers who respond to advertising. This is a segment of the customer file that is decreasing in size. We look for attributes that suggest a customer must be advertised to, in order to purchase. Customers who order over the telephone, customers who give catalog key-codes when shopping online, customers who click-through e-mail campaigns, customers living in zip codes classified as "Catalog Crazies". These customers are unlikely to buy in the future unless they are marketed to. Then we have customers who use algorithms to purchase. Yup, these are the customers who use tools like paid search to purchase merchandise. These customers are different. They don't always respond to future advertising, and when they do respond, they combine advertising and algorithms to make decisions. This is where your Net Google Score comes into play. Catalog brands really struggle with algorithm customers, and online marketers struggle with e-mail marketing programs for algorithm customers. Increasingly, we find ourselves managing social customers. If you're Crutchfield, you have customers who buy merchandise, customers who write reviews, and customers who are referred from blogs to your site. The latter two groups represent "social customers". Social customers are different than are typical catalog customers, and are different than typical e-commerce customers. Catalogers are way behind the curve when it comes to managing social customers. In fact, almost everybody is behind the curve regarding social customers. Hint: Social customers don't necessarily embrace catalogs, and sometimes get really angry when they are stuffed in the mailbox. Finally, we get to the most valuable customer on the planet, the organic customer! I receive a lot of criticism about my assertion that there are customers who do not need to be advertised to. Why? I don't know. Many of you think customers only buy something if they are advertised to. Amazon.com gets a lot of organic business. Now it is true that maybe Amazon sent an e-mail at one time, and you bought because customers like you purchased certain texts. But that doesn't explain the fact that you see "Outliers" discussed on a blog, so you go and buy the book on Amazon (that makes you a social customer!). Or maybe you read about the book in New York Magazine, then buy it on Amazon (that makes you an organic customer). Organic demand is the most important kind of demand to generate, because it comes without advertising cost. Retailers have thrived for centuries via organic demand. E-commerce is a hybrid of retailing (organic demand) and cataloging (advertising demand). So how did project work change? 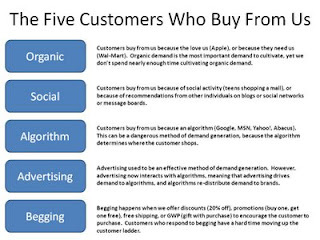 These days, I score customers across each of the five dimensions listed above. If the customer generates organic demand, the customer gets an "A", if not, the customer gets an "F". The same process happens for Social Customers, Algorithm Customers, Advertising Customers, and for Customers Who Respond To Begging. Once customers are graded, we monitor migration. Does the "Begging" customer migrate to "Organic" status? If so, then discounts and promotions work! Does the "Algorithm" customer slide down to "Begging"? If so, then Google isn't doing us any favors. Is the "Advertising" customer married to advertising? If so, then we have to keep streaming the catalogs at this customer. We apply the migration patterns, understanding the long-term trajectory of your business. Finally, we identify the customers who we can stop marketing to, without a significant dip in business. Online pureplays are using this methodology, too ... they want to understand who should receive e-mail marketing, and they want to understand how deep they should dive into paid search. Retailers ask me to do this, so that they can identify retail shoppers who are unresponsive to direct marketing, customers who have a high organic percentage. Catalog Choice should love this (especially given the slowdown in user growth in recent months), because the end result of the project is the discontinuation of catalog marketing to customers who no longer respond to advertising, while protecting the catalog relationship among highly responsive customers. That, my dear readers, is a description of the type of project I am being asked to work on by online marketers, retailers, and catalog brands. And it is big-time fun! Good post, Kevin. 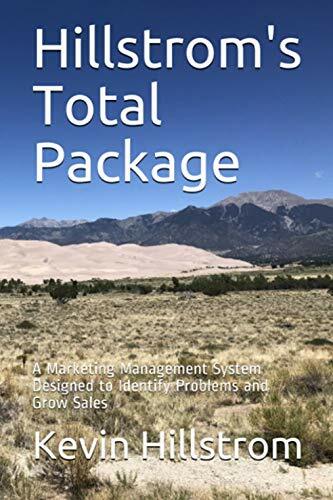 This is an interesting framework that seems to take the perspective of the marketing effort/cost required to produce a sale. The question of the Organic group is likely one of attribution. This has always been a problem for direct marketers: which customer touchpoint gets credit for the purchase? Are there any cases where an Organic Customer would not originally have been influenced by one of the other methods (ie. Coupons/offers, advertising, search/algorithm, or social/word-of-mouth)? Smaller businesses and startups are likely to acquire new customers without organic assistance. Bigger companies have some newbies that are organic. Organic really comes into play when an established company (Amazon as an example) is able to generate sales without really doing anything. Apple might be another example ... you buy an iPod/iPhone because your friends have an iPod/iPhone. Non-ubiquitous brands have this phenomenon as well, just not as great as at Amazon/Apple.